Looking for a small apartment? Want more than just a studio apartment? Well, Siegel Suites has the perfect solution: a Jr. 1 bedroom apartment. These affordable apartments are like a large studio apartment with a half wall between the living room and bedroom. So you get more privacy than with a studio. Rents for our Jr. one bedrooms are surprisingly cheap and include apartment amenities that you’d expect to pay a lot more for – like free premium cable TV, free utilities, swimming pools, laundry facilities, and more. And we make it easy to rent with no long term lease and bad credit ok. 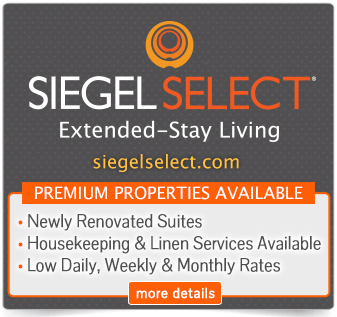 Call us at 1-888-328-0192 to rent a Jr. 1-bedroom apartment at Siegel Suites today!